Known as "The Samoan Bulldozer," Edward Fatu was a member of the Anoa'i wrestling family. 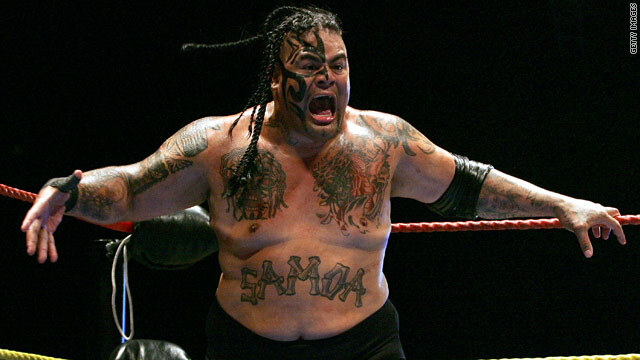 (CNN) -- The death of World Wrestling Entertainment superstar Edward Fatu, who wrestled under the name "Umaga," has sparked discussion in wrestling circles over the rigors of the sport. Fatu, 36, died Friday of a heart attack in a hospital in Houston, Texas, a family friend confirmed. Also known as "The Samoan Bulldozer," the 6-foot-4-inch, 350-pound wrestler earned a reputation for executing moves with more ease than one might expect from someone his size, facing off in high-profile bouts with WWE celebrities such as Triple H and Ric Flair. "He was basically known for being an athletic, big man who carried some extra weight around, but moved very well for a guy his size," said Kevin Eck, an assistant sports editor of the Baltimore Sun who also runs its professional-wrestling blog, Ring Posts. Comments on Eck's blog range from messages of condolences to speculation over whether drugs were involved and the struggles wrestlers grapple with outside of the ring. "[H]ardly do we realize what do these wrestlers go through.....not that long ago he looked as if he could go on for 20 years in the ring looking as vicious as he was," one post says. Fatu worked on and off for the WWE for several years before the organization terminated his contract in June for violating the WWE's Wellness Program and refusing to enter rehab, the WWE said on its Web site, without providing specifics. The organization offered its condolences to Fatu's family in a brief statement on its site. Details of Fatu's death have not been released, but Eck said the death highlights a larger problem of professional wrestlers dying in their 30s and 40s. Fatu's death comes less than nine months after Canadian pro wrestler Andrew Test Martin reportedly died of a drug overdose, and follows a string of high-profile deaths in the past decade, including those of Chris Benoit and Eddie Guerrero. "It's happening a lot more frequently in the sport than it ever did, and it's a huge problem," Eck said. "If this was Major League Baseball and you had guys dropping dead under 40, it would be a much bigger deal -- but because it's wrestling, it flies under the radar." Though wrestlers today have more support systems available through the WWE and other groups, the rigors of the sport have increased dramatically compared to the days of Capt. Lou Albano, who died this year at 76, Eck said. "The expectations for what wrestlers are supposed to look like have evolved. In Albano's day, some were in good shape, some were not, but you didn't see the superhuman physiques like you started seeing in the 80s," he said. As the industry has gone global, wrestlers also are traveling more and going farther than they did pre-WWE, when wrestlers and promoters worked within limited territories, he said. And the demands in the ring are higher than ever. "You could get by with doing less back in the day, you didn't see a lot of high-risk maneuvers. And as it has evolved, so has the need to do more risky-looking stunts, and that's why guys get a lot of bumps and bruises, and you can sort of make the correlation that that leads to more painkillers." In an interview with CNN after Albano's death, WWE spokesman Robert Zimmerman said the organization provides medical assistance and financial guidance through the WWE's Wellness Program to all its wrestlers, even though they are considered independent contractors. "If they're injured on the job in the ring, we take care of their medical expenses and get them to the best doctors possible," Zimmerman said. "In addition to their physical well-being, we also take them through financial counseling and financial workshops so they know what to do with their money as far as income, earnings and sponsorships. And those are just a few aspects of the program." To friends and family, Fatu was a devoted family man who was looking forward to spending more time with his children after leaving the WWE. "He had his demons, but he found a lot of strength in his family," said family friend and former WWE personality Dawn Marie Psaltis. "He comes from a long line of professional wrestlers and did his family proud." Psaltis, the founder of Wrestlers Rescue, a support group for aging and retired wrestlers, says Fatu's death highlights the unique struggles that wrestlers face as independent contractors who don't receive the benefits of athletes or professional actors. Like many wrestlers, Fatu did not have health insurance when he died, leaving friends and family scrambling to cover his medical expenses, Psaltis said. "We make above average income, but most of what we make goes toward the expense of being in the business, and health care is a huge expense for a wrestler," Psaltis said. Psaltis said she started Wrestlers Rescue with the goal of working with insurance companies to create an affordable health care plan for wrestlers. "To find health care that covers wrestlers costs quadruple the price of regular coverage, so a lot of the guys end up going without. They continue to wrestle way past their prime because there's no pension, and because there's no health care, they never prepared for their future health concerns. It's an endless cycle." But Psaltis and former WWE diva Terri Runnels say camaraderie and the thrill of being in the ring are worth the risks. "Yes, we make good money, but for what we do it's paltry. We are like paupers compared to most other professions, but our pride in entertaining and making sure that when you pay money and come to a show you are absolutely entertained, that's why we do what we do," Runnels said.